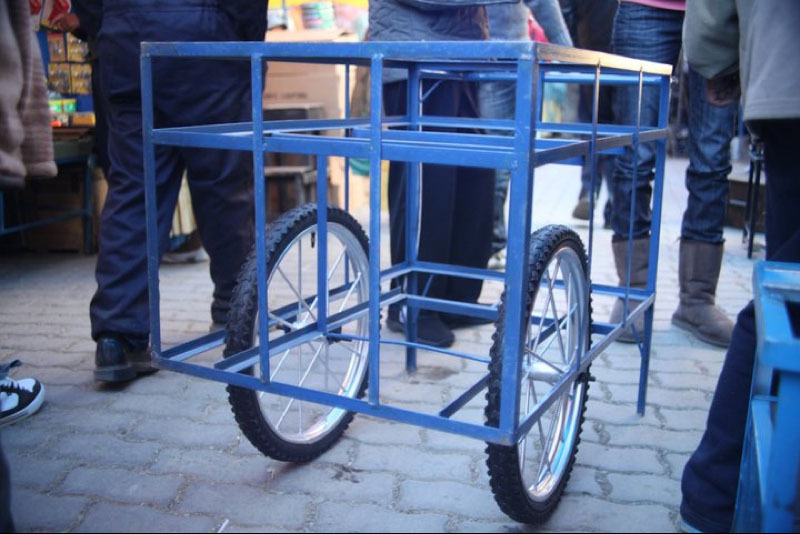 In June of 2010, a team of architects, designers and educators traveled to Bolivia, where they partnered with children working on the streets of La Paz and the local non-profits who work with the children to generate new, street-based versions of education. 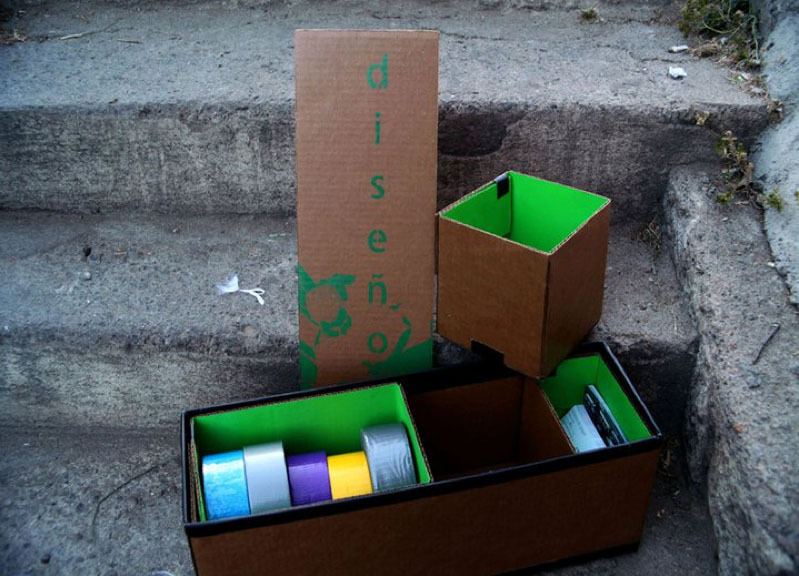 One year later in the summer of 2011, a small team of designers and artists including myself returned to Bolivia with the International Design Clinic (IDC), where we once again partnered with local non-profit organization, the Espacio Cultural Creativo (ECC), to design a series of 'educational constructs' tailored to the rigors of the street. 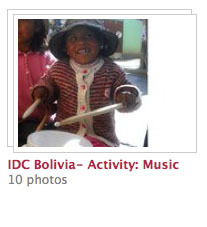 Our goal is to create a School for the Creative and Performing Arts in La Paz. We approach this by exploring the environment in which these children work, building education prototypes accordingly, and launching series of investigations on the streets with them in various parts of the city. Each of these 'constructs 'are designed to foster expression in a specific aspect of arts education, including theater, music, 2D art, writing, and photography. We use the term 'construct' to encapsulate the various external forms our ideas might take. 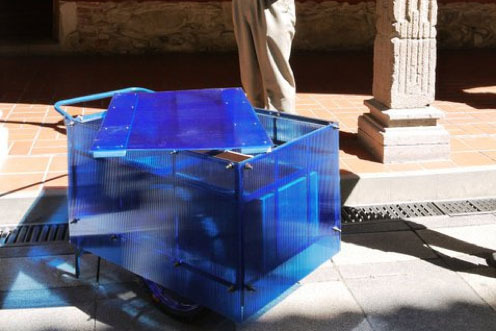 Once installed on the streets, the constructs function to provoke, measure and react to the responses of children who might one day occupy, or even take ownership of the educational system created. 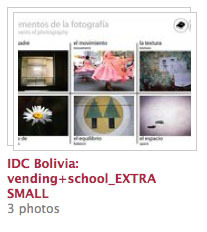 _ vending+school_EXTRA LARGE is a School for the Creative and Performing Arts. When combined, all scales of the work operate as a unit, creating a network of educational devices thoughtfully situated within the streetscape. 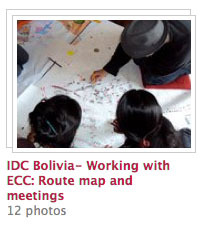 Where we are in our process as of 2011: During this year’s collaboration between ECC and the IDC, the work has increased in scale and complexity in terms of educational activities and the architecture that supports them. 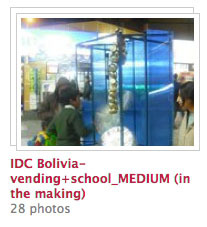 The work shown within this web page charts the shift from vending+school_EXTRA SMALL postcards to vending+school_MEDIUM constructs. 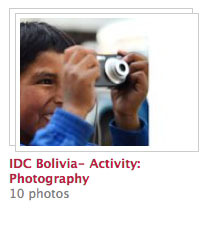 The perspective of this web page is based on my involvement as one of the nine participating IDC members, as well as my capacity as an observer with a double role, to put together an exhibition of our work at the local museum in La Paz at the end of our one-month stay. 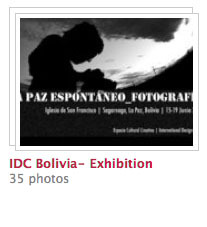 An exhibition titled Spontaneous La Paz was put together at the final week of our stay in Bolivia, using the museum as a site of distribution and exchange of ideas. The exhibition featured the work-in-progress of this education initiative to date, and was presented as a framework of possibility and propositions, rather than as answers and solutions. Objects, photographs, audio and video curated in the space attempted to draw relationship to the various strains of inquiry. They also articulated our present success and failures, and projected our trajectory. Outlined below are the contents that were installed in the exhibition. In addition to these were sound tracks played throughout the exhibition, and a video screening of the performances held at the closing reception. Our next goal is to have all the materials organized as an online exhibition so as to continue the dialogue. The vendingMAP is an adaptive blueprint and a seminal part of this research that we would follow every day while working in La Paz. The map traces the positions and operating hours of existing vending businesses within the busiest areas of the city. 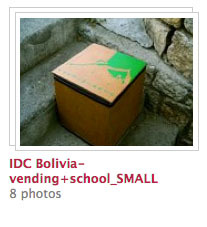 Different layers of the vendingMAP reveal the activities of mobile Lustrabotas (shoe-shine boys), circulating handcarts, and stationary vending booths. Based on the highest density of the streetscape activities, three routes were designed to use vending+school_SMALL activities to perform research, instigate response and to measure success. Stocked within each vending+school_SMALL contructs were _EXTRA SMALL postcards that were handed out to participants at the end of each activity. Additional postcards were distributed through the Ludateca, hosted by ECC, as well as throughout the exhibition. The postcards provided participants with guidelines to replicate and elaborate on activities on their own time. They also allow for participants to trade with others, thereby further expanding the lesson in informal ways. Extending from vending+school_EXTRA SMALL instructional postcards, vending+school_SMALL constructs contain simple activities that facilitate creative expression in a structured manner. 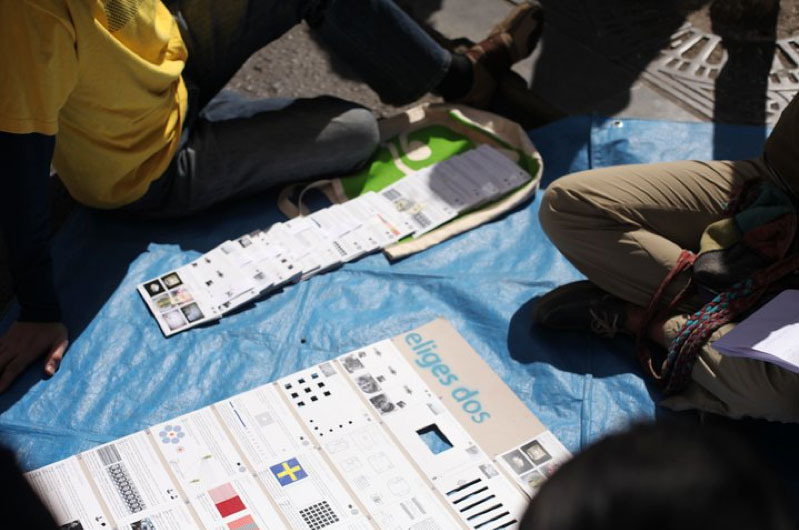 As each the four vending+school_SMALL contructs occupied the streets, tracings and evidences of creative expression and problem solving were recorded and documented. Using simple props, a blackboard and a cardboard stand, we staged impromptu theatrical performances in parks and street corners along the route map. 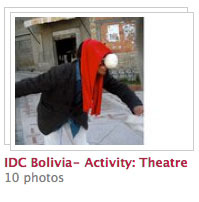 Activities included performing conversations with the body, creating a continuous story, emotion-control games and the preparation work for a puppet theatre. Combining musical instruments with ordinary found objects like plastic tubes, taped drums and wearable found-instruments, we explored body movement, rhythm and texture of sounds throughout the streets. The recorded audio tracks showed a mix of familiar melodies, chaotic traffic, children's laughter, and sounds of venders soliciting attention. The audio tracks were later repositioned as 'pockets of symphony' throughout the exhibition space. 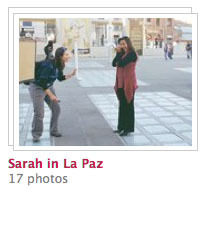 The work from the photography construct reflected the participants' collective view of La Paz through multiple lenses. Provoked by curiously shaped periscopes and pinhole cameras, the activities were lessons on the physics of light, visual perception, and the possibilities into a poetic way of looking. This construct on applied arts played with the possibilities of simple paper folds, writings, and challenged the museum audiences to join the street-graffiti of stories on the San Francisco plaza over the course of the exhibition. A piece installed in the museum courtyard is the first act of another shift from vending+school_SMALL to vending+school_MEDIUM. The vending+school_MEDIUM is designed to foster both performance and music, and will deployed over the coming years, eventually paving the way for larger and more complex forms of street-based arts education. 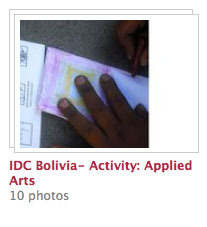 The International Design Clinic is a registered not-for-profit that provides students, artists and designers the opportunity to use their unique creative talents to design and construct projects for communities in need throughout the world. 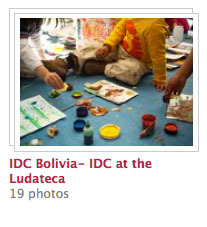 Since its inception in 2006, the IDC has completed over a dozen projects on three continents, including an urban tent for the homeless made of trash; a communal playspace for Romanian orphans from construction debris; a vision for education based upon borrowed resources for the migrant communities of India; and a three-dollar projection system designed to rearticulate the manner in which art and architecture is conceived, displayed and regenerated. Espacio Cultural Creativo (ECC) is a non-governmental nonprofit organization in La Paz that works nationally in education and culture. 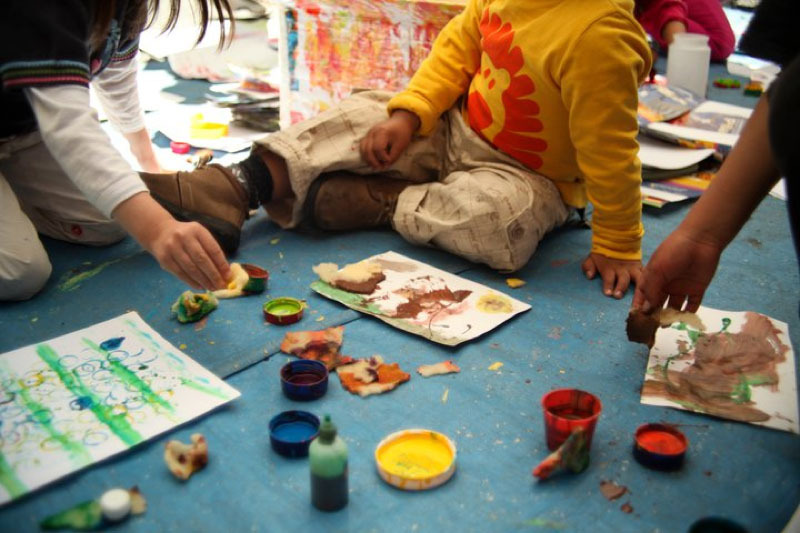 The ECC seeks to transform education by enhancing and strengthening the capacities and expression of creative individuals, and to reverse social disadvantage, exclusion and inequality. 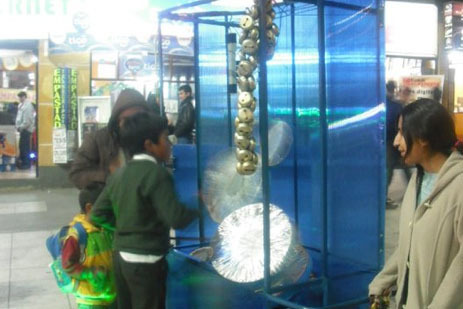 Through the methodology of Ludo creative expression in human resource training, the ECC promotes opportunities for meeting and interaction between generations and cultures.